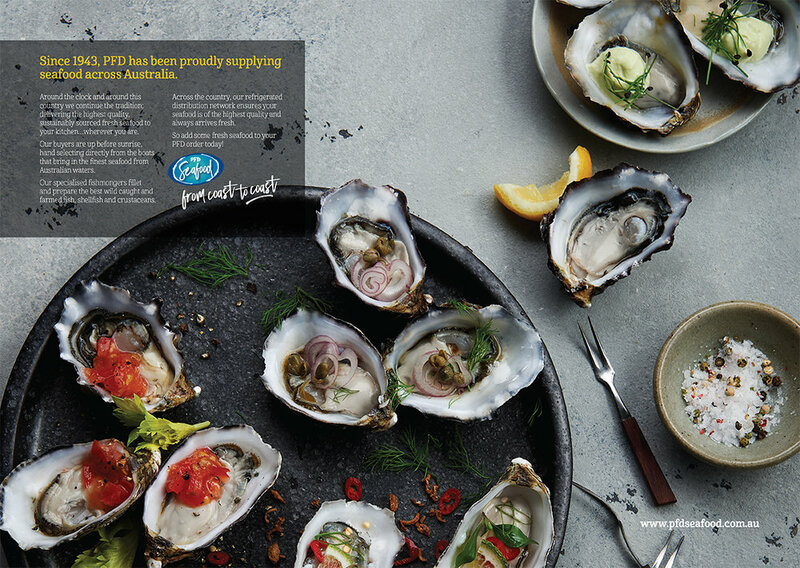 Ckaos worked closely with the Seafood team at PFD Foodservices on a complete launch campaign for PFD's national fresh seafood range. This campaign was designed to communicate PFD's ability to delivery fresh seafood across the country...from coast to coast. Ckaos were responsible for the creative production of hype reels, supporting trade presenters, stand alone seafood website, social media collateral and internal training documents. Working with ARC Films we produced a mouthwatering launch hype reel that tells the story of the PFD fresh seafood process. From early morning fish boat docking to a seafood feast in the heart of Australia's desert. PFD are excited to launch our national Fresh seafood range. Supplying fresh seafood to our customers across Australia. We have worked with the team at Ckaos to bring this campaign to life through a range of multimedia, digital and print executions.